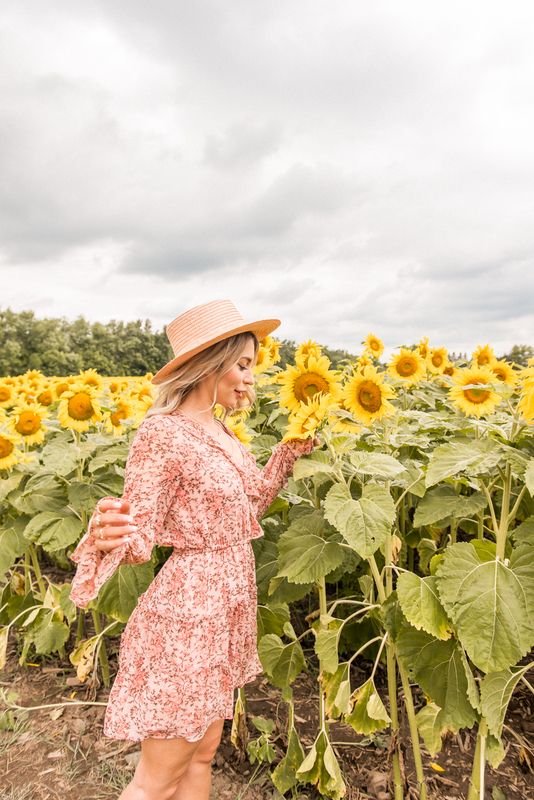 The Sunflower Field and Instagram Photo Etiquette | La Petite Noob | A Toronto-Based Fashion and Lifestyle Blog. 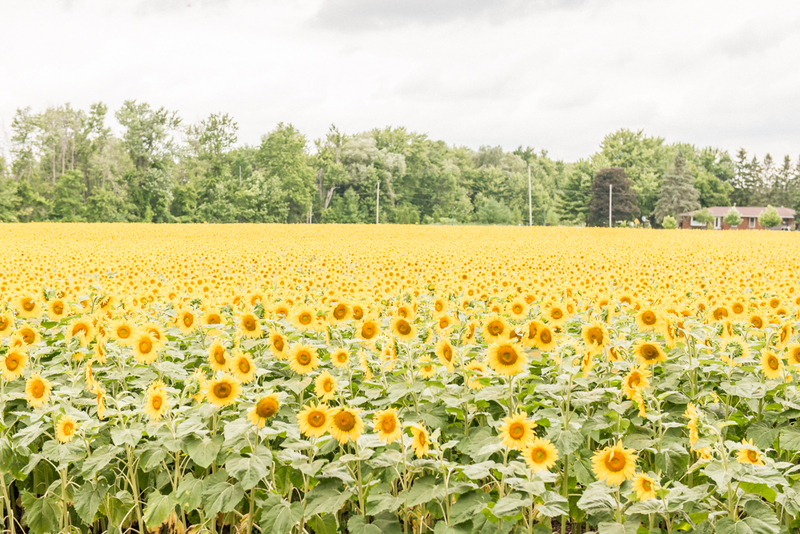 Nestled in the countryside of Hamilton, Ontario lay Bogle Seeds. A family run business, Bogle Seeds makes their primary income farming sunflower, corn, millet, oats, barley and also bird seed. 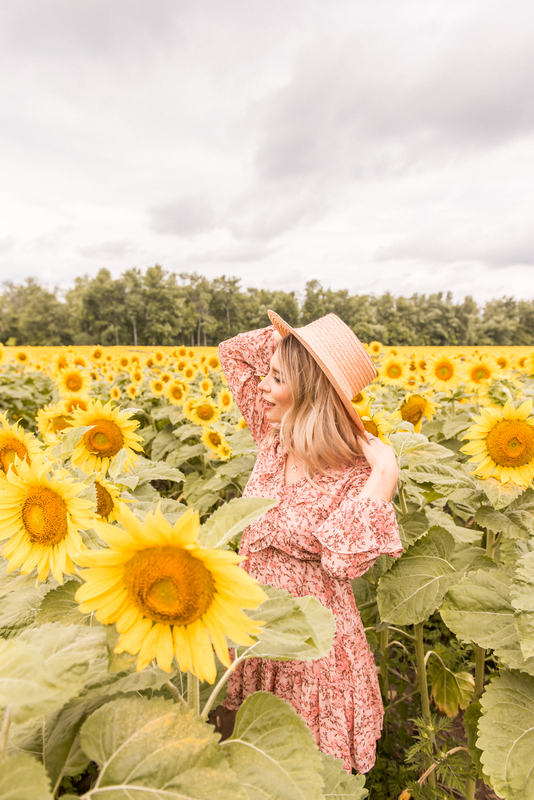 A few years back, they opened up their beautiful 75 acre sunflower fields to the public, charging a modest entrance fee for access to a literal postcard come to life. 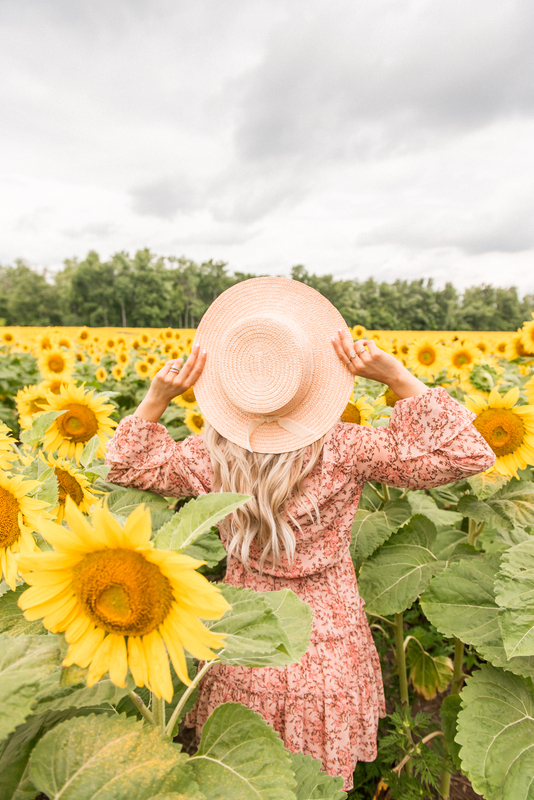 I visited this beautiful sunflower field on a Monday and it was magical - greeted by the Bogle family themselves, we paid our entrance fee, joined the handful of other people - mostly families - taking photos, took our own photos, enjoyed the view and then packed up and drove down to Burlington for donuts. It was the perfect morning. This past weekend all hell broke loose. Due to an apocalyptic amount of visitors, mob-like behaviour and police intervention the Bogle farm is closed to the public indefinitely. If you're interested in this learning more about what went down this past weekend, The Globe and Mail sums up the entire story very well. This whole experience has got me thinking. While I do not think that this is the fault of bloggers, content creators, Instagrammers - whatever you want to call us - I do think that in stories like this we do have a target on our back. After all, our jobs include scouting out locations like Bogle Seeds to take photos of ourselves. While we all set off on our quests to capture the perfect photo in different locations and businesses, our actions can have consequences to the owners and I think it's about time to contribute to the discussion of social media and content creating etiquette; the dos and don'ts of taking photos in other people's property and places of business. This first point seems so simple, but it's a step that oftentimes gets neglected from us DSLR-toting types. The easiest way to avoid any potential mishaps from shooting photos in someone else's location or place of business is to simply ask them if you can. This can be achieved by either contacting the business before arriving, or asking the owner or an employee before taking out your camera. Most of the times the answer will be yes, but this can open up the dialogue for the business to let you know of any areas they want you to highlight or stay away from. Although the general rule has always been to treat each location like it's your own house, I beg to differ; while I'm inclined to move things around and step on furniture at my own condo, I would definitely think twice before doing that at my mother-in-law's house. The same principal should be applied to each and every location that you visit with the expectation to take photos. Would you re-arrange furniture, step on furniture, pee in the bushes (yes, this happened at Bogle Seeds) at your in-law's place? I'm willing to bet no, and definitely not without asking first. Each place you visit to take photos is someone else's business and livelihood - treat it with respect. One of the things that broke my heart the most when reading about the mayhem the descended on Bogle Seeds over the weekend is that people were sneaking into the fields without paying the modest $7.50 fee. You guys if there's a fee to pay, then pay. If you're taking photos in a café then buy a coffee. A restaurant, then buy some lunch or at least something to-go if you're not planning on staying long. Pay the fee, buy the coffee - it's literally the least you can do. I've been there - you drive all the way to a location for the sole purpose to take a photo and it's just not working. Wether it be the lighting, the crowds, anything - your photography vision isn't coming to fruition and you start to get frustrated. This is the time that all of the social media photo-taking etiquette rules start to fall out of the window, and you start to let your frustrations get the better of you - moving furniture, disrupting other patrons, or being rude to staff just to get the shot. The thing is, it's just a photo and it's in everyone's best interest to know when it's just not working and move on. It's obviously impossible to know, but I honestly believe that the Bogle family would still be open to the public if the people had realized that the conditions just weren't working for photos, abandoned the vision and just moved on to enjoy their weekend. I really hope that this post doesn't come off as preachy. The more social media is ingrained into our everyday lives, the more we're going to encounter situations like this and I think that the actions of a few affect us all. Let's all take a minute to step back and check ourselves and how far we'll go for the perfect photo, wether it's your full-time job or not. It's not worth sacrificing your morals and the livelihood of others. It's ultimately just not that serious. It's just Instagram. Interested, as always to know what you guys think. I totally agree - I felt the same way when I heard about the sweet owners being mouthed off to. Definitely speaks to abandoning the vision if it's just not working out. This was definitely a lesson on how quickly things can go viral on social media! It's definitely such an unfortunate situation. Thank you so much for taking the time to read! Thank you so much for reading and sharing! I appreciate it. OMG it sounds like it was madness. It breaks my heart, since it was such a beautiful place to visit on a Monday when there were no crowds and everyone was being respectful. Definitely a huge eye opener for me. This is very sad. Lets Keep it Wild wrote a great post about geo-tags. 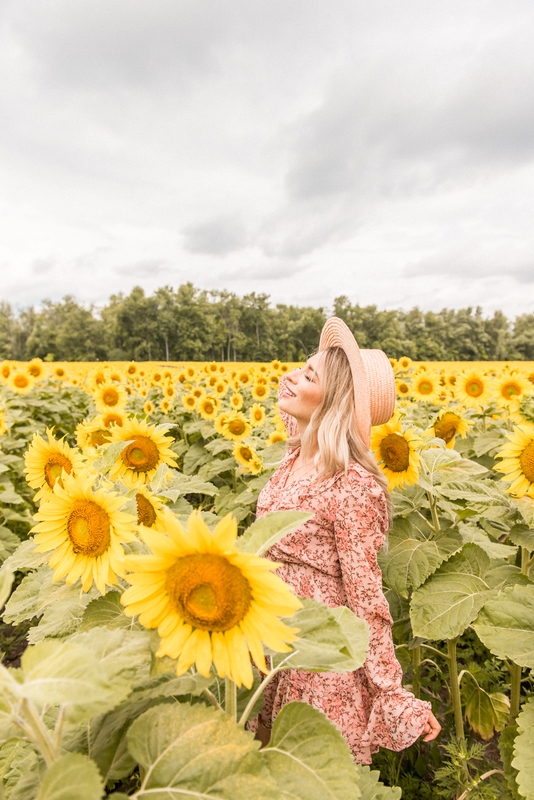 Thank you so much for sharing this article, Lisa! To be honest, I had never considered not sharing a geotag from the amount of frustrated comments I receive the odd time I don't. Huge eye opener, I'm definitely going to be more mindful from now on. I loosely touched on this in a blog post earlier this week and shared screenshots of the Globe & Mail article. My soul just hurts at how gross the majority of our society is, to treat these people horribly when they have so kindly invited the public onto their property?! Ugh. I used the exact word of "magical" to describe my experience at this farm and I'm just so sad and disturbed at what happened to them and their farm Saturday. Honestly I've been glum for days about it, ask my sister (Michelle Liane, who commented already! Haha) I think it's because the Bogle's were so nice and the experience was so magical it makes it so sad. Absolutely, it's just such a frustrating situation for such a nice family. This will definitely be a topic that will continue to come up as social media becomes more ingrained in our everyday lives. Thank you for starting this conversation. Your advice is both thoughtful and important. Such a great message. I agree with all your points. Such a beautiful place, it's so sad the way it was mistreated. Hopefully your post and others like it will bring to light the etiquette we need to keep in mind as social media continues to be more prominent in our everyday life. Aside from that, your shots are absolutely stunning ~fields of gold~.